This may not help much, but it's kind of interesting so I'll post what I've got. 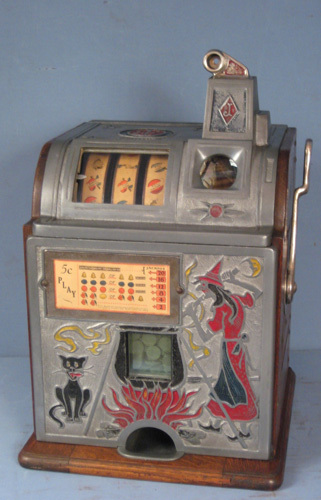 This shows the jackpot on a Mills Extraordinary with a case drilled and slotted for a vender, and holes where it had an OK Vendor patent plate, which I believe dates it to about 1935-38. It's something of a barn find that hadn't had much work done with it and then seems to have sat for a long time, with a swapped out mechanism in it that even has original 1934 World's Fair joke reel strips. 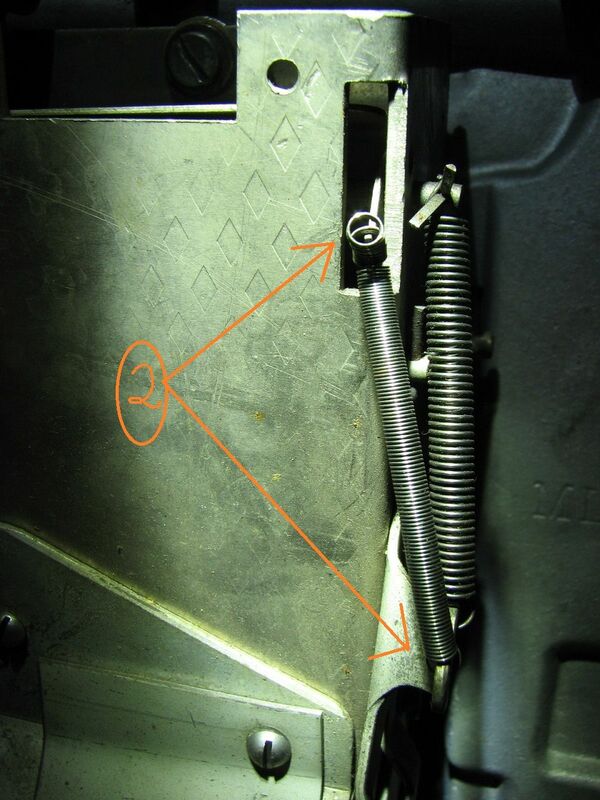 As can be seen, it's got a spring that's too long and has been looped - though it looks like it might be the same spring on the left in the picture above that is attached to what seems to be a tab added under a screw. My old reprint of the folded sheet Service Manual and Repair Parts List illustrated with photos of a War Eagle and its mechanism, looks as if it shows your configuration 2. 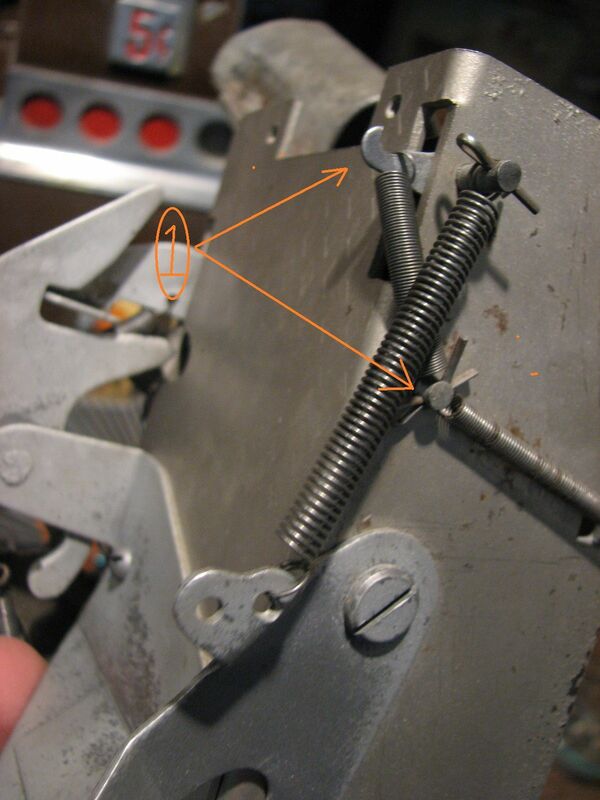 My bound repro of a later version illustrated with a High Top, shows the long thin spring attached to the tab on the screw, though rotated 180 degrees so that it attaches to the right of the screw head. The original configuration with the shorter, thicker spring must have had some sort of problem, particularly if they tried to retrofit one of the later-type longer springs to a machine like mine. I'm literally just about to order a jackpot spring kit from Berten's. Now I'm curious about what spring they provide for this. I cannot make out the first two pictures in the post as they seem to miss part of the jackpot mount points, but I have around a dozen or so spare jackpots and it is a 50/50 split on the two variants already shown. Sega who made them later on seem to follow the long thin spring to the tab point as shown in the top jackpot in below picture.